Full of shimmering detail, Welcome to Lagos is a stunning portrayal of an extraordinary city, and of seven lives that intersect in a breathless story of courage and survival. This interview was originally filmed/streamed live on Instagram May 8, 2018. Navidad: Hey everyone, it’s Navidad Thelamour. I’m here with the fabulous, wonderful author of Welcome to Lagos, the book we’re going to be talking about today, Ms. Chibundu Onuzo. She is here joining us to tell us all about her book and all about herself so if you guys have any questions or anytime you want to chime in, just let us know and we can see all of your comments and she can answer our questions for us. So we are here with a fabulous author who has already been shortlisted for the Encore Awards so I’m so excited to be here with her. Meanwhile, as you see me flipping through the book you’re gonna notice that I wrote so many notes, which is for me, as all my readers know, the highest praise. I always say to my readers, if it doesn’t have bathtub marks on it or pen marks on it, it was not a very good book. I know things have been so crazy with this being just your second novel and you’re doing tours and all sorts of things. How has this tour been for you so far? Navidad: Did something like that happen to you? Chibundu: No, but I’m gonna try and recreate and run in to the road. Try and get a car to hit me! Navidad: Don’t do it in New York. It’s the worst place to do it. It’s the worst place to do it, they really will hit you. They’re crazy, those drivers. So you’ve gone to New York. What other cities have you gone to? Chibundu: So Atlanta’s my next stop, and then after here is Dallas, then Houston, then Chicago, then I’ve lost the trail. But I start in New York and I finish in New York, so my last stop is New York as well. Navidad: Perfect. So I know that you’re in school, you’re a PhD candidate. Are you still in school for your PhD? Chibundu: I’ve handed in my dissertation, my thesis, but then what’s next is the oral exam. So I haven’t done the oral exam, but I’ve done my thesis. Navidad: Okay. Well how is that fitting in with your tour all around the countryside? Chibundu: Well I hope my supervisor is not watching this. I am not doing any PhD work at the moment, but I will try to because I do need to do a little preparation for the oral exam. Just read through the thesis again and try to anticipate any questions that might come up. So, maybe when I get to Chicago. Navidad: Maybe, just on the road. Maybe on the plane. Well, until then, you’re gonna be on tour talking about your fabulous book, so I do want to ask you, what was the jumping off point for Welcome to Lagos? Chibundu: Okay, so I knew I wanted to write a book with a lot of characters because I had read a book called Sea of Poppies, which has a lot of characters, but I didn’t know which story these characters would take. I just wanted a lot of characters, which isn’t really a novel. Beginning, lots of characters, end, lots of characters. So, I had a dream about two soldiers, and they were the soldiers that ended up being Chike and Yemi. And these soldiers refused to carry out an army order in the dream, and then I woke up and I thought, ‘That was really vivid.’ So, you know dream logic, it didn’t really, quite make sense. So, the Nigerian soldiers were in a medieval castle…don’t ask me – like, it was a fantasy book! But after I wrote it down, I then thought, ‘How can I transcribe this to real life?’ So then I put them in the conflict in the Niger Delta, which is a more realistic place to find Nigerian soldiers than a medieval castle. And then I decided to have them disobey an order that was based on a real-life event. So, in Nigeria, in I think 2000…it maybe be 1999 or early 2000s – there was a village destroyed – or actually, a town destroyed – called Odi – by Nigerian soldiers. So, then I kind of transcribed it to that situation where, ‘What would happen if your commanding officer created an order to carry x, y, z to destroy?’ basically. And so they say no, then they have to desert, because it is a capital offence to desert the Nigerian army. So, they run off. And then I chose Lagos as the destination for them to run off to. Navidad: Okay, was that because it was your birth place? Chibundu: Yes, I think so. I kind of like interviewed other Nigerian cities and I was like… “I know Lagos is best.” I still had to do some research, but it’s not like going to a completely new place. And then of course, the thing is, so they’re running away to Lagos and other characters come and join the party, and then I have my large cast of characters and then the story continues. Navidad: Alright, so first of all, I wanna point out how cool that is that the jumping off point for this was literally a dream combined with real events that happened. So that’s crazy and super creative that you were able to put those together. So, we appreciate you for that because, (holds up book) that’s how we got this! So, as you’re journeying through this novel, first of all, what was your writing process like? How long did it take you to write this novel? Chibundu: It took forever. So, this isn’t my first novel, but it’s my first published in America. So, the first novel had only two main characters, so it was a very close kind of perspective because there are only two main people. And then, I guess, in this novel, where I have I’ll say a core cast of five and two others, so 7 kind of main characters, that was a lot more difficult to write because to keep track of everybody and everybody’s story – and I actually had a lot more characters in the book but I had to kill them. Navidad: Oh, okay. We’ll get to that. Hold on. Hold on. So as you’re building this cast of characters, I know that some characters do die in this book (dramatic sighs), we’ll get to that at the end. But did any characters have to die off of your narrative call sheet? Let’s say, did you have more characters and you had to cut them out? Navidad: Really?! Can you tell us about maybe one of those that didn’t make it in? Chibundu: Okay, I’ll tell you about one. I don’t really like talking about characters that didn’t make it in because the only book that exists for the reader is the final version, but I will say, so I had a baby. And it’s kind of like a cliché trope. So, when you have a group, how you bring the group together is you know, they focus on a baby and they sort of bond around the baby. So, there was this baby. The problem was I kept forgetting about the baby! It would be like seven chapters have passed… ‘Oh, where’s the baby? !’ and ‘who has the baby?!’. *Laughter* Babies are very – of course, when you have adult characters, you can shift focus from a character and it won’t be so weird. But with a baby like… nappy, food, sleeping, crying at night – like, there’s so much work you have to do! So yeah, the baby had to go. Navidad: …and so lyrical. Honestly. Including, once you read the book, the acknowledgements. I’ve never even seen acknowledgements done like that! *turns to the audience* Her acknowledgments were essentially a poem. It was fantastic, and I just absolutely loved it! So, I’m wondering, as you’re going through your writing process, does it just all come out of you all at once or do you have to go back and do editing? I know for me, for example, if I’m writing, I’ll just let it all out and then I’ll go back with a glass of wine and it’ll be a very slow process. What’s your process? Navidad: Alright, well let’s talk about the actual book itself, inside the pages. So, as we move through Welcome to Lagos, we follow a group of characters *turns to the audience* – and I won’t tell you all the good bits because we’re gonna read the book! But, we follow a group of characters and they go through a series of trials and tribulations. They are homeless at one point, and they all learn lessons in the end. I wanted to know what that like was writing such a gritty, raw story and what is it you wanted your readers to take from it in the end? 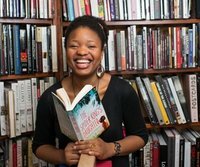 Chibundu: Well, what I wanted readers to take from the end, first and foremost, is to just have enjoyed the book. It’s not a ‘how to’ text. I just want you to have enjoyed the book. And I hope you read it and you’re interested in Lagos and you’re thinking, ‘Okay, this is a place I may have seen only one story about.’ I don’t think this is a 100% positive or negative. That’s not what I’m trying to do. I’m just trying to show that Lagos is a complex, complicated, interesting place. And one thing I did in the book is I show different entrances and exits to the city. So, my main characters—I would say they’re quite…they don’t have a lot of money—they’re quite poor. So, they come in by road and when they get there, they’re coming from a rural area. And what a lot of people don’t realize is that Lagos is like the el Dorado for so many people who live in rural parts of Nigeria—and also not just Nigeria, but West Africa. So, for them, coming in from the rural areas, they arrive and all they can see is the infrastructure and the glitz and bridges. It’s just like a sensory overload. But in the book, I also show people entering the city from a western city like London and when they enter the city, all they can see is what Lagos is not. So, they’re like, the roads are not tarred how they are back in London or the electricity is not stable like it is back in London, and instead of seeing all of the opportunities and all of the complexities all they can see is what it’s not. And I just wanted to play with that because I have a lot of people leaving and entering the city. So, I want you to be curious about Lagos. Navidad: Yeah, and you will be curious about Lagos because she describes it in so many different ways. We see the rich areas of town, we see the poor areas of town. We see some devastating things happening to these characters, we even see…I’m trying to explain to our listeners the—I suppose like a delta, or pond these people live on? Chibundu: Ah! So, they live on water! It’s called Makoko and it’s like a floating city. There’s houses built on stilts on the lagoon and it’s informal housing in the sense they haven’t got a government-approved grant to live there. But at the same time, that community has existed for over 100 years and the community actually predates Nigeria’s independence. In a sense, to say that they are not “formal” is kind of like, ‘Yeah, you guys just arrived and now you’re telling us we’re not formal.’ But yeah, they live there. And I did want to show kind of as many sides to Lagos as possible. Navidad: *turns to the audience* Well she did that, for sure. So, when you come in to this book and you read these pages, you are going to sweat from the heat of these characters. I mean the descriptions are wonderful. You’re gonna feel exactly what they feel and that is one of the things I really took from this book, so thank you for that. Also, I wanted to know, there is a lot of social commentary in this book and I think that’s what made it very special. What do you think is something you think that your country or society could do better or what would you like to see be done better? Chibundu: I mean this is a difficult question to answer outside of Nigeria because, ‘Yo we don’t talk bad about ourselves in public! Like outside of Nigeria, Nigeria is the greatest!’ So I can write about Nigeria in a complex way in my fiction because in that way, I am not the Minister of Tourism. I know that not everything is always positive. I’m not writing as myself, I am writing with my imagination, which is a little bit separate from my personal identity. But then now, you’re asking me, Chibundu Onuzo, to say something bad about Nigeria on camera. We’re the greatest! Come to Nigeria and see for yourself. Navidad: I think that’s fair. *turns to the audience* What do you think? You think that’s fair? And everyone’s waving. Let’s wave. Navidad: Okay, well now I want to go. Chibundu: You need to go. Navidad: Particularly to Lagos. Because I had never been there, but I have a friend whose actually from there, but I’ve never heard her describe it like this, so I appreciate that. And then lastly, I just wanna ask after all of this is done, you’ve had all of your book tours and you finish your PhD, what do you think you want to go on and do next? Navidad: Are you sleep deprived now? Chibundu: Obviously some of it is from jet lag, like waking up at 4 a.m. But also I just really need my sleep. Obviously this story came to me in a dream. So I need to do more sleeping so that I can do more dreaming. But I think I want to diversify as well. I want to try and kind of move in to other forms of writing stories, maybe film, maybe TV series…Hey Shonda! Navidad: Shonda! Hit her up! Do you see her!? She’s ready. Navidad: And I mean you are a historian by trade, right? Chibundu: So that’s the thing. During my PhD, I found so many interesting historical stories. And I think, not all of them jump out as novels to me. Some of them jump out as other things, like film. I started watching so much television. Like I’m always on Netflix now, and I’m doing research! Being Mary Jane, whooo! Chibundu: Oh, I was going to sing your name! Chibundu Onuzo was born in Nigeria in 1991 in Lagos and is the youngest of four children. She is a History graduate from King’s College London and is currently an MSc student in Public Policy at the University College of London. She is also the author of The Spider King’s Daughter.